The first step in the journey to effective employee relations is evaluating current processes and workflows. 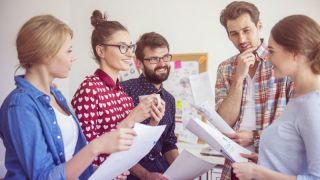 With the foundations of business success built upon a happy and productive workforce, it’s no wonder that business owners are realising the importance of putting their employees first and prioritising well-being and overall job satisfaction. The focus of these efforts comes from the HR department and as the first point of contact for employment issues, it’s up to them to communicate important information, develop relationships, navigate employment law and even resolve workplace conflicts. Sometimes, this involves managing sensitive issues such as absenteeism and misconduct which can infringe on overall productivity. It’s important that when handling serious matters like these, issues are resolved efficiently and documentation is managed, controlled and recorded in a systematic way. As it’s no secret that bad processes squash employee motivation and damage experiences. With HR departments aiming to deliver transparent processes and increase efficiency, it’s worthwhile looking at what tools HR professionals have at their disposal to help to improve employee relationships and drive job satisfaction. The first step in the journey to effective employee relations is evaluating current processes and workflows. In many cases, employee relations issues such as conflicts, grievances and disciplinaries are being tracked via spreadsheets containing only the most basic of information. HR departments should aspire to move past these outdated systems and implement cloud-based technologies which offer advanced features and automated processes. This will provide HR teams with a much clearer picture on the volume of cases they are handling, the most common case type, as well as how close each case is to completion. Implementing this level of transparency not only helps the department to maintain good employee relations but also provides easy access to crucial data. In this instance, good employee relations technology can afford HR departments the opportunity to gather accurate data and in turn use that information to influence and support strategic decision making. HR teams looking to improve accuracy and reduce human error, should seriously consider cloud-based tools as a way to increase efficiency and ensure that data is automatically backed up and recorded. They not only support a reduction in administrative tasks but also provide a useful audit trial to reply to any unanswered questions on either side of the process. It’s also important to point out that businesses are under no legal requirement to process and store any information regarding employee relations cases, however it’s a good idea to keep track and record this information. Especially in the event of an employment tribunal, no HR team wants to be faced in this position with no evidence or data to back up their actions and statements. Once HR teams are using cloud-based technologies, the next step is to use the data generated by the system to identify key trends. Analysing data in this way will help HR professionals to make data-driven decisions in order to attract, manage, and retain employees. As well as enabling the HR department to remain objective but also to create better work environments and maximise employee productivity. Having easy access to key HR case information allows the HR department to keep on top of frequent and commonly reoccurring issues in a reactive manner – using data in this way can prevent serious issues from escalating. This data can also provide HR with the necessary information to make comparisons between current cases and those that may arise in the future such as delays and blocks in the system. The next layer to this is that HR teams can then look to identify patterns within cases and build similarities as to why certain cases might be reoccurring. Being able to analyse the data in this way boosts fairness amongst employees and makes sure that everyone is treated fairly. With many HR departments taking an increasingly strategic role in business operations, the need to implement data insights holds the key to succeeding with any employee relations programme. Lastly, having the capabilities to track and monitor key issues such as employee engagement, can be very useful for HR managers. HR case management systems can locate key trends and pin point future problems that may arise within the business. Observing employee data in this manner allows an individual to monitor specific similarities in employee behaviour, helping HR managers gain the bigger picture of what may happen within the organisation. This level of intelligence allows HR managers to talk to employees to resolve situations before the problem gets worse. An example of this would be punctuality, which can increasingly decline over a period of time as employees become more disengaged with the workplace. Now, of course there might be personal matters contributing to a drop in attendance but this information gives managers the opportunity to consider other factors such as workplace issues, volume of work, or problems in managerial leadership. No matter what the reason is, processes can be put in place to resolve these issues naturally and decrease the impact it can have on the wider business. Increasing productivity within the HR department can help to contribute towards more stable relationships with employees as well as a reduction in business costs, as a result of decreased absenteeism and admin processes. Implementing and championing more streamlined processes can give HR managers the necessary direction to focus on strategically aligning the department with the overall business objectives. These tools make it simpler for the HR teams to manage multiple cases at once, as it provides a clear overview of each case, the status and next steps. Presenting information transparently not only helps the department to gain a clear picture of what’s going on in the organisation but also means that workloads can be shared easily between HR officers. It also presents the opportunity to use HR data as a tool for business growth and effective employee relations. By monitoring employment trends, HR professionals have the ability to deliver important insights to managers which can help to navigate areas of concern before they come to a head. Ultimately, the ability to provide data driven insights helps HR departments bridge the gap between the boardroom and contribute towards the success to the business.